Hi friends! This month's blog hop with the Beauty & Fashion Blog Community is all about stuff we're thankful for. And yes, we're thankful for our family and friends and food and everything, but today we're going to be a little shallow and talk about our favorite material possessions. Because it's almost Thanksgiving, and people always forget about it in favor of Christmas, which just isn't fair. 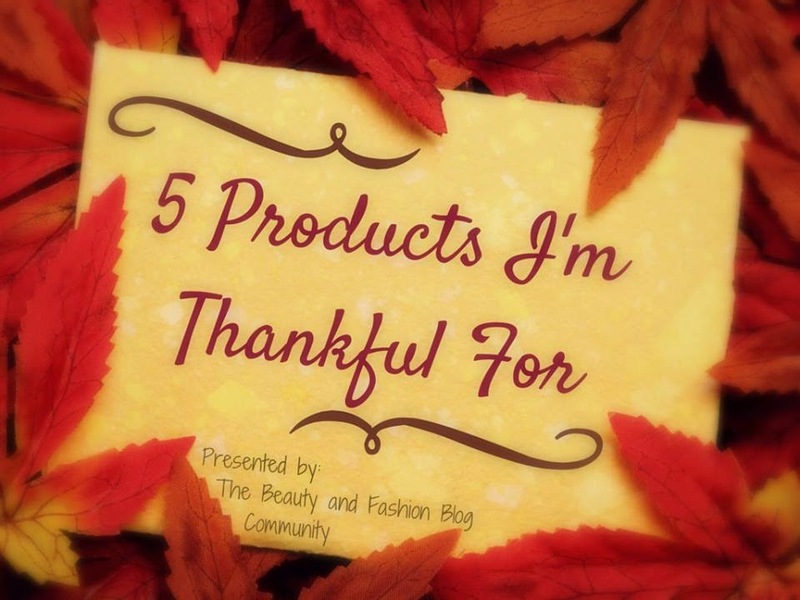 So, without further ado, here are the five products I'm most thankful for this month. I love how this guarantees that I'm getting all of the dirt and excess oil off of my skin! Sometimes just one-step cleansing isn't enough, especially if you're wearing makeup, so I love using this after my face wash to pick up anything that's left over. It also helps reduce and unclog enlarged pores, which I'm sure anyone who has a problem with blackheads (like me) would appreciate. It can take a few weeks to unclog the deepest set blackheads, but be patient and I promise you'll love it. This also comes in a Gel and a Lotion form, so all skin types are covered. I'm combination-dry and I really like this, so you do you. So, I've been living under a rock, up until a few months ago when I finally picked this up at my local TJ Maxx. This dry shampoo works wonders! As a blonde-haired girl, I can get away with using baby powder, but that doesn't do nearly as good of a job as this. Unlike baby powder, this doesn't make hair dull and lackluster. Also, it makes hair not only look clean, but feel clean! A few spritzes, a quick brush-through, and it's like I just cleaned my hair. It's a shower in a bottle! The floral "Blush" scent is my favorite, but they all work the same. I'll admit, I was pretty skeptical about this brush at first. I saw everyone on YouTube raving about it, but I wasn't so sure I would feel the same way. However, I tried it and I absolutely love it! It's synthetic, so it doesn't soak up all of your foundation, and it doesn't shed like natural-haired brushes tend to do (*cough* the Sigma E40 *cough). The flat top really helps buff the foundation/BB cream into the skin, so you can say "I woke up like this." Aquaphor has saved my lips time and time again. Going to college in New England is fun and all, but my lips really aren't a fan of the freezing cold temperatures and the fact that winter essentially lasts from November 'til April. That, and due to the fact that I never seem to get in eight full glasses of water a day, my lips are always fighting the battle of staying hydrated. Aquaphor is the one lip balm I can depend on to instantly make my lips feel better, and help actually heal them when they're painful and chapped. Still looking for more product recommendations? Check out these lovely bloggers! What things are you thankful for? (You can also be thankful for non-shallow things, like the people in your life. I'll allow it). Want to see more monthly blog hops from the Beauty and Fashion Blog Community? Click here! Want to see more products I love? Click here for my monthly favorites posts! Disclaimer: Not sponsored, no affiliates. I purchased all of these myself. Well, actually that's a lie. The Clarisonic was a Christmas present from my mom because she loves me. Shoutout to my family--they're a monthly favorite, too. 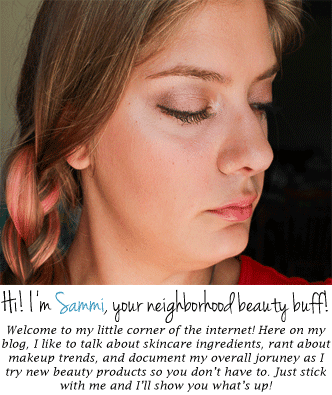 © 2013-2016, Samantha Penninipede. Powered by Blogger.